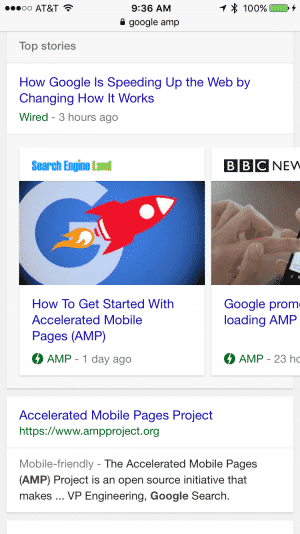 You might have used Google’s new AMP project without even knowing. It’s a technology that makes mobile page results load very quickly on Google, it displays the content in a more uniform fashion. But there’s a problem. Like Medium, where you get all these amazing advantages of content publishing—but only if you write on their service—Google AMP is progress that takes us backwards. I’m not one to claim that original ideas always need to be perfectly preserved. Sometimes old ideas need to die out and be replaced by better ones. But this isn’t one of those. The entire point of the Internet was to directly connect content. The idea is to have different people create things that were connected to each other. That’s why they called it a web. But now we’re seeing these new models that are looking to break the system. Create central platforms and get everyone using it. Build a search engine and display people’s content without passing the user through to it. We’re talking about an all-powerful ad company that’s looking to explicitly break the peer-to-peer model between creator and consumer, for the singular purpose of increasing profits. Will it make pages load faster? Sure. But we can fix that in lots of ways over time. You don’t break the peer-to-peer model of the internet because it’s annoying and in need of optimization. So, short version, AMP is bad. It’s an attack on the core principle of net, inter, web, and all the other metaphorical terms that we think of when we imagine the internet. They all mean connectedness. To each other. And they want to sit in the middle, collect the content, and present it to you themselves. Because they can, and because they’ll make more money if they do. An example that comes to mind is an artist who has a small gallery in a bazaar. Then Walmart shows up with a digital camera, takes a picture of everything in the gallery, runs it through a Prism filter, and then posts it at the main hall at the bazaar entrance (they’re friends with the governor). Then, when people ask where they can find this piece or that piece, they tell them to look at the other stuff here and to stop asking questions. That’s not good for art. It’s not good for the artist. And it’s not good for the bazaar. It’s only good for Walmart. Sep 21, 2018 — Fixed some formatting issues.